What I’m currently using: the Paperblanks Blue Filigree journal, Winnable Executive Journal, the Seven Seas Writer, and the Franklin Christoph Notebook. 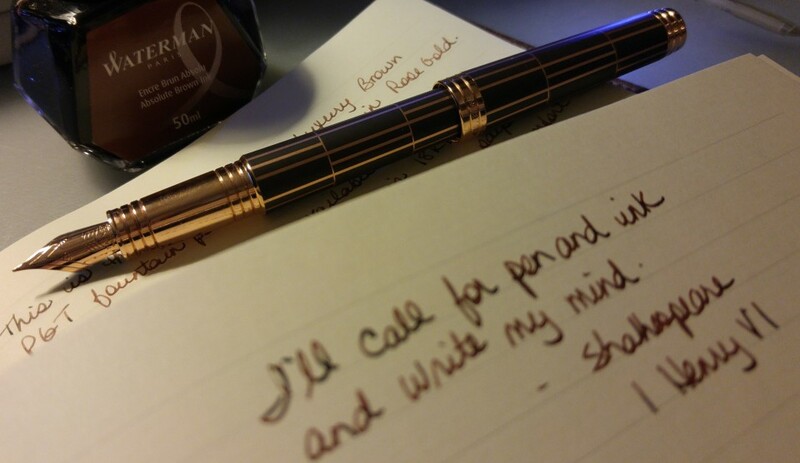 Still using the Al-Star, bringing it to work with me every day and using it for notes. I will announce the pen for February on January 27. I finished my Christmas Journal posts and I think this Sunday I will talk about my Boxing Day Pen! I haven’t made any purchases this week. Giveaways: Check out my post NaJoWriMo and a Giveaway and enter to win my Monteverde Poquito! Giveaway closes on January 30. I’ve fallen behind in my NaJoWriMo journaling but I will catch up this weekend. Hopefully! I created a new ink journal, which is actually a binder. Review coming soon. My friend is going through a stressful time right now, and wanted to get herself a journal to write some things down, to focus her energies on getting through. She bought herself one but it ended up in the snow by accident. It was kind of ruined so I have a pile of journals marked for donation and I brought in a few for her to look at and she chose two. She was really excited to use them and that just made me excited for her. She’s already writing up a storm! Love all the different colours Jackie! Had lunch with a friend on the weekend. We hadn’t seen in each other in a while but it was just like old times. Isn’t that a wonderful feeling with good friends? We laughed until the tears flowed and then talked about life and feeling our age and our parents and heroes dying and millennials. Can’t wait to do it again Muge! I’ve been thinking a lot about bullet journals. Anyone use them? I am very happy with my Hobonichi but the bullet journal system intrigues me. Lots of videos on YouTube and each one is slightly different. Just may have to make one for myself. Mourning the loss of Bowie, Rickman and now Glenn Frey. Tough week. Until next post, happy writing! I used a Bullet Journal all last year in a Plain Moleskine and loved it. Would have done it this year but wanted to try the Hobonichi, which I also love. I kept my Bullet Journal simple which was great for me. Some people get pretty elaborate with them, but the older I get the more simple I like things so it was great that you can customize it exactly how you want. It worked really well for me. I tried it for a month before I committed to a whole year-maybe do that and see how you like it. Good advice Missy. I went for the Hobonichi because of the paper and I am loving it so far. But the ability to customize appeals to me because I find myself not using the whole daily page. I’ll have to plan out this experiment! I love the paper too-the best ever! Hope your experiment is a success! Thanks! Either way I will share on the blog!